Billy Sherrill was born November 5, 1936, Phil Campbell, Alabama, and showed interest in music at an early age. He played saxophone in blues bands, and even signed a record deal as a performer, but this is not where his eventually success would stem from. In 1962 Billy Sherrill moved to Nashville where he was hired by Sun Records impresario Sam Phillips to manage the Memphis-based company’s Nashville studio. Later Sherrill would move on to become Epic’s in-house producer and work on numerous pop records. But that is just where Billy Sherrill’s country career began. He started working with country icon George Jones in 1971 (who was once married to Wynette), and produced albums for George Jones all the way up to 1990. Sherrill was responsible for producing the George Jones hit “He Stopped Loving Her Today”—the song many consider the greatest country music song of all time—among many other hits. Sherrill was critical in convincing Jones to cut the song, and to stay true to the song’s melody. Though Sherrill was considered one of the driving forces behind the softening of country music in the 70’s, he also worked very specifically with numerous of country music’s defining Outlaw artists, including producing virtually all of David Allan Coe’s recordings, and many of Johnny Paycheck’s biggest records. Sherrill also worked with Johnny Cash later in his career, including on Cash’s recently-released “lost” album, Out Among The Stars. Other stars Billy Sherrill produced over the years include Marty Robbins, Charlie Rich, Tanya Tucker, Ray Charles, Janie Fricke, Moe Bandy, Ray Conniff, Elvis Costello, and many more. Billy Sherrill was married to his wife Charlene for 54 years, and is also survived by his daughter Catherine Lale, and grandchildren Samantha and Matthew. 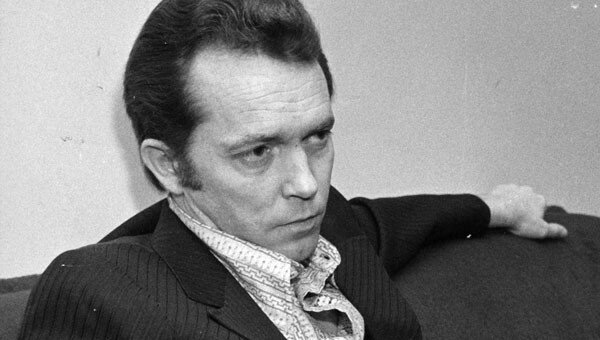 Country music would not sound the way it did, or be as successful as it was if it wasn’t for the work of Billy Sherrill. He was the true behind-the-scenes guy who made sure some of country music’s songs made an indelible mark on the listener. Good Lord, we’ve lost too many good people in country music this year. Oh man… 🙁 RIP Billy. That song was penned by John Scott Sherrill. Pretty sure that was a different guy. My favorite song of all time, from any artist, and any genre of music. No lie. Are you going to have an end-of-the-year recap that includes all of the legends and important figures we’ve lost in 2015, Trigger? This is looking like a morbidly record year. Seems like we’re losing someone important every week, sometimes every other day. This is sad news. I’ll take Countrypolitan music over Metro-Politan music any day. We are losing a lot of good country artists this year. Billy Shirrell will be missed. Billy Sherrill is the reason Tammy Wynette is a joke figure instead of being recognized as one of the greatest female singers of all time, if not the greatest. I loathed the man while he was alive and I will not cut him a break just because he called in dead. Sherrill did as much to destroy country music as anyone. Sherrill did as much to destroy country music as anyone, and he also did just as much, if not more to help it. Years back I totally would have agreed with you, but after studying the breadth Sherrill’s work over the last few years, I think the guy deserves way more credit than the Outlaw era mindset gave him, especially for his contributions to David Allan Coe and Johnny Paycheck, which spans pretty much the entirety of their output. Billy Sherrill was a pragmatist, and could mold his approach to whomever he was working with at the time. Though countrypolitan gets lumped on his shoulders, that sound counted for maybe 1/3’rd of his output. All the great work he did with George Jones? You can’t deny the man had his hand in some serious songs and albums. Chet Atkins is the man whose ox needs to be gored for destroying country music because he was an executive as well as a producer. While I’ve sunnied up to Sherrill over recent years, my sentiments on Atkins have pretty much stayed the same. Agreed. Atkins was pretty much the spiritual father of tyrannical label execs like Mike Curb. Sherrill, on the other hand, seems like a great producer who would do the best work possible with the parameters laid out for him. I feel like a lot of stuff Chet produced was good stuff. I have some early Willie Nelson, it’s great stuff. People like Tommy Overstreet and Jimmy Dean recorded some great material under Mr. Atkins. Now then, the flip-side, was that a lot of that material deviated very strongly from the definition of country music in the era. It wasn’t Chet’s production as much as he was the impetus of putting businessmen directly in the studios calling shots on creative output. It is that mid-level command bureaucracy that is still in place on Music Row today. Where are you getting this idea that Tammy is a joke? I’ve always considered her one of the best. And I’m a guy that always gets accused of being too rigid on what’s Country. Clint, I’ve always considered her one of the best too but let’s face it, in American culture she’s defined by Sherrill’s godawful productions of Stand By Your Man and D-I-V-O-R-C-E that made her, but not Sherrill, shorthand for over the top Countrypolitan excess.There’s a stripped down version of D-I-V-O-R-C-E on a compilation album by a singer called something Brahms that practically makes me cry when I hear it and I just wish Wynette had got to record it that way. 2: Tammy Wynette was not a great performer. She was very rigid in front of a camera (haven’t seen her live myself so all my experience is via television/internet. She kind of moved like an animatronic. Tammy Wynette is just about my favorite female country singer of all time. In the years of her heyday, I never had the chance to see her either live or on teevee, I just listened to her records and her voice on the radio, and that voice, coming out of that tiny little woman, was amazing. I remember Dolly Parton said something along the lines of how she was always amazed to watch Tammy sing, because she never used her body, “bent into” a song, etc, to get that sound out of herself, and Dolly couldn’t understand how it was even possible. To me, that showed it was just a gift from God, that all that shy woman (at least when she was starting) had to do was open her mouth and out came that voice. When I listen to her songs, I’m not even thinking about how she looked, her presentation, etc, I’m too into the song. It seems to me that all her dynamism went into the song, and if I have to choose between watching a singer “present” or hearing everything they have come across in their singing, I’ll take the latter, if I have to choose. Trig, well I’m with you about Chet Atkins, never forget, never forgive. However, while I respect your overview on Sherrill’s career, I still think the evil that he did lives after him and if you judge people by the worst thing they ever did, he burns alongside Atkins for all eternity. Do I sound a little fundamentalist here? No, I definitely understand this stance because I felt the same way for years, and still can definitely see how he helped usher in Music Row’s command and control system that included a lot of the softening of the country sound. I think it would be interesting to plot a career arc for Sherrill. By the end he was doing more than anyone to keep the sound of country, country. Writing or producing music that you don’t like is a far lesser evil than destroying employees’ careers. Sherrill was solely a musician, not an economic tyrant.